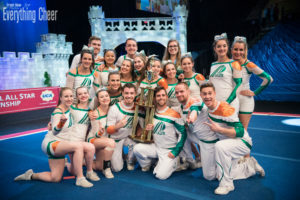 The third leg of the Varsity Triple Crown, the UCA International All Star Championship, took place on March 10-11 at Walt Disney World’s Wide World of Sports Complex. Many teams saw the weekend as one last chance to go up against their biggest competition before Worlds and the Summit next month, in the same venues where those events will be held. The division to watch was definitely Small Senior Coed 5, where the majority of the top teams in the country came together one last time to compete against each other before next month’s big Worlds showdown. Fresh off their win at NCA in Dallas, Twist & Shout Diamonds were the team to beat, with the reigning world champs Brandon Senior Black and former world champs California All Stars Smoed putting up a good fight to beat them. In a division so tough that any team could win on any given day, the top 5 rankings switched up quite a bit between days 1 and 2, with UCA newcomers California All Stars Smoed taking home their first-ever UCA jackets, Twist & Shout Diamonds landing in a close second, and KC Cheer Fierce Five making the jump from 5th to 3rd place. In the newest Worlds divisions, X-Small Senior 5 and X-Small Senior Coed 5, all eyes were on the local Florida teams. 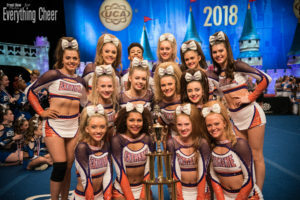 Cheer Express Miss Silver has spent the entire season dominating the X-Small division, winning Cheersport, NCA, and being the only team this season to earn the Varsity Triple Crown by also winning UCA. As we gear up for Worlds in a month, Miss Silver is going to be the team that all the other X-Small teams are aiming to beat. We can’t wait to see if they’ll be able to maintain their undefeated season! In X-Small Coed, Broward Elite Kat 5 led the division after day 1, but Cheersport winners Extreme All Stars Senior 5 was able to make the jump from second place to first on Sunday, taking home their second set of jackets for the season. 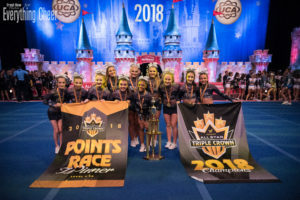 In what many saw as an upset in Small Senior 5, Brandon Senior Pink dethroned Cheer Extreme SSX, who were going for the Varsity Triple Crown after winning Cheersport and NCA earlier this season. While Cheer Extreme SSX still remains a fan favorite heading into Worlds, Brandon Senior Pink has proved that they won’t hold back and that they have the skills to win against the top teams in their division. The Medium Senior and Medium Senior Coed division winners came as no surprise, with Top Gun Lady Jags and World Cup Odyssey winning each division, respectively. Both teams settled into first on day 1 and were unable to be beat on day 2. The Large Senior and Large Senior Coed divisions were noticeably smaller this year, with Cheer Extreme Senior Elite, Maryland Twisters F5, and Cheer Extreme Coed Elite declining to come to UCA this season. Stingray All Stars Orange and World Cup Shooting Stars went head to head, proving just how close their scores can be when they hit. Orange took the early lead on day 1, but Stars came back with a vengeance on day 2 and were able to clinch the win. In Large Senior Coed, it was an equally tight race, with Stingray All Stars Steel sitting in first on day 1, but Top Gun Large Coed nailed their routine on day 2 to seal the deal and win the division. In the International divisions, newcomers Brandon All Stars Smoke took home the win in International Open Small Coed 5, last year’s winners and reigning world champions Top Gun SICk 6 successfully defended their title in International Open Small Coed 6, and Top Gun OO5 beat out tough competitors the California All Stars Ghost to claim the champion jackets. View a list of level 5 and 6 results and Worlds bid winners below, and click here to see a full list of results from all divisions.